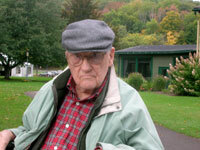 Laurence Frederick Gray, 95, passed away peacefully on the morning of May 3, 2011, at his daughter’s home in Alfred, NY, where he had lived for the past two years. He was born in Victoria, BC, on December 15, 1915, to Andrew and Mae Gray. Laurie gained his US citizenship in 1951. On March 26, 1944, he married Ray Thackray Gray from Winnipeg, who shared his life until her death in 2007. He is survived by his son, Robert Gray, of Silver Spring, MD, his daughter, Andrea Gill, and her husband, John Gill, of Alfred, NY, and his four grandchildren, Flora Gill, Katie Gill, Linden Gray and Laurel Gray. His daughter, Kathy, of Beltsville, MD, predeceased him in 2009. Laurie was a pioneer in satellite communications. He received an electrical engineering degree in 1938 from UBC and a master’s degree from George Washington University in 1977. He joined the Canadian Marconi Company in 1938 and worked on transmitter development. He joined the Canadian Navy from 1943 to 1945. In 1945, he and Ray immigrated to the US. He started working on the development of FM transmitters at Federal Telephone and Radio, which later became part of ITT. He then started work on television transmitters. When satellites became available, ITT was awarded a contract for an earth station, which Laurie designed, for a low-orbit satellite. In 1964, he joined the Communications Satellite Corporation and was the chief engineer of the COMSAT Lab for the development of earth station equipment until he retired in 1980. Laurie was a member of Bradley Hills Presbyterian Church in Bethesda, MD, the Canadian Club and Saint Andrew’s Society in Washington, DC, and was docent at the Museum of American History at the Smithsonian Institute ham radio display. As a summer resident of Eastham, MA, he was very involved the French Cable Station Museum in Orleans, MA.